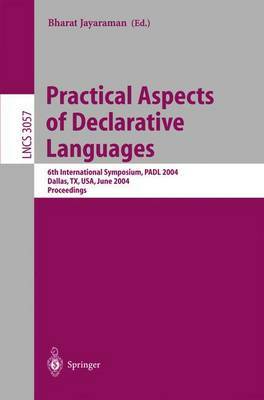 The International Symposium on Practical Aspects of Declarative Languages (PADL) is a forum for researchers and practitioners to present original work emphasizing novel applications and implementation techniques for all forms of declarative concepts, especially those emerging from functional, logic, and c- straint languages. Declarative languages have been studied since the inception of computer science, and continue to be a vibrant subject of investigation today due to their applicability in current application domains such as bioinformatics, network con?guration, the Semantic Web, telecommunications software, etc. The 6th PADL Symposium was held in Dallas, Texas on June 18-19, 2004, and was co-located with the Compulog-Americas Summer School on Compu- tional Logic. From the submitted papers, the program committee selected 15 for presentation at the symposium based upon three written reviews for each paper, which were provided by the members of the program committee and additional referees. Two invited talks were presented at the conference. The ?rst was given by Paul Hudak (Yale University) on "An Algebraic Theory of Polymorphic T- poral Media. " The second invited talk was given by Andrew Fall (Dowlland Technologies and Simon Fraser University) on "Supporting Decisions in C- plex, Uncertain Domains with Declarative Languages. " Following the precedent set by the previous PADL symposium, the program committee this year again selected one paper to receive the `Most Practical - per'award.